By default, all the contacts you add are Personal Contacts. You can view, modify or export them from your account. All your personal contacts will automatically appear in your address book. You can add categories to Personal contacts, to group them and use them to add multiple contacts during Compose. When the organization administrator adds a user or a group, the email address gets added to the Organization contacts automatically. All the organization contacts appear automatically in the autofill when you compose emails. When a new user is added to the organization, the user can easily look up or compose emails to colleagues using the Organization contacts. The Organization contacts are common for all the users of the organization. All members can view the contacts and use them. However, only the organization administrators can add or edit or delete the contacts from the organization contacts. Apart from the internal organization users, if you want to add any common external contact, for users to access easily, the organization administrators can add them. This will be useful for third party contacts like Insurance providers, Partners common to the organization or other service providers for the organization. The organization contacts you have added will be used in multiple places like Search, Streams, Tasks, Email Sharing, Folder Sharing etc. Zoho Mail supports groups to enable better collaboration among different teams that a user is a part of. Group Contacts are helpful when you want to have a set of common contacts for the entire group, but not to the entire organization. The group contacts are accessible only to the members of the group. Only the moderators of the group can add or modify or remove contacts from the Group contacts. You can group a fixed set of contacts by adding them into a category. The Categories help you to add a 'batch' of bulk contacts to your email when you compose an email. Personal and Organization Categories are listed in the 'Address book' for easy access while composing an email. You can create a new Category by clicking on the Add Category option on the left pane under Viewssection. You can also create contact categories directly from the Address book in the Compose editor. Click here for detailed instructions. Categories can be added to Organization or Group only by the Admin or Super Admin of that organization or group. You can add contacts to categories by dragging and dropping the contacts into the desired category. You can add multiple contacts at once to a category by selecting the relevant contacts and clicking on the Add to icon. If you want to remove a contact from it's category, click on the relevant contact in the category list and select the Clear contact icon. You can right-click on the Category to Rename or Delete them. 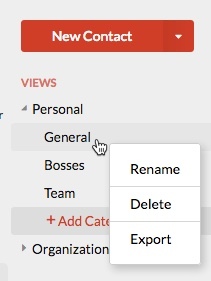 You can use the Export option in the right click to export only the contacts in that category.